Knowing how to start an import export business is challenging and takes some study and research but the rewards are great. Here’s a few tips and ideas on what to think about as you start your venture. Starting an import export business or any business for that matter, is exciting and hugely rewarding. The sweat, hard work and hours that you put into your own company, benefit you directly, rather than your boss or manager, you reap the rewards. Making all the decisions and being accountable only to yourself is a freeing feeling and the rewards are many. Securing your own financial future, earning the respect and admiration of colleagues, friends and family as someone who took the risk and went out and built their own company is a satisfying feeling. Working the hours that you want to work is a huge advantage over having to work endless hours for someone else. Let’s get to the point and tell you how to set up your own company, how to trade on the International stage successfully and point out some of the most common pitfalls, so that you can setup and trade successfully and most importantly, profitably from day one. You’ve thought long and hard about what you want to buy and sell and how to build and grow your company. Many are eager to jump right in and buy stock and start selling, however before you start up your business and spend your hard earned money on stock it’s vital to test the water and find out if others are as enthusiastic about your product as you. You may THINK that the product you want to sell will be successful and you’ll make a healthy profit from it but in reality this may not be true. We’ve all seen Dragon’s Den where a budding entrepreneur thinks they have the most revolutionary idea or product but the wise Dragon’s don’t see it! Just because you like a product it does not mean that the public will like it and part with their hard earned cash to buy it. There are many ways to find opinions on your ideas and products. Sometimes you have to be a little creative in how you approach it but its time well invested. Start with friends and family and ask for honest opinions. Discuss pricing and ask your friends if they would pay for your product. Hold a focus group in your local neighborhood, give your product to the focus group and ask for their thoughts and feedback. There are other ways that you can conduct market research too which we cover in our import export training course. If you’re looking for some inspiration for ideas, check out or blog post “What Can I Import and Sell?“. As we continue our course teaching the best practices for starting your International trading company, it’s extremely important to know where to buy your products from. This is the foundation of your business and will dictate if your business is profitable. A common complaint we hear from many entrepreneurs is “I know what I want to import and sell but I don’t know where to get it from”. Where can you source products from with such a huge amount of suppliers in a global market place? You must understand how to source your product from the right supplier with the right terms and price. Many traders rely on Internet suppliers like as Alibaba and other such companies. These companies a certainly worth looking at there’s no harm in this but you’re limiting your search. There is a great myth among buyers in that you get the best price, product and terms from China. This is not always the case! China is not actually the centre of global trade. Sourcing from companies in Preferential Trading Countries (PTC) can be a much easier and cheaper way to go. Facing buyers will be a key part of any trading that you do and following some simple guidelines will make the process easier, give you more confidence and give you a much higher conversion rate. Buyers will want to see samples of the goods they intend to buy and samples come in all shapes and sizes. Some are easy to obtain from supplier such as clothing, toys and watches. Others are bulky, such as construction and capital equipment. Most producers will give a limited number of samples free of charge to a serious buyer or at a nominal cost. It’s important to make sure you know how the products work when you receive these samples, as you will have to make presentations to potential buyers so familiarise yourself with all aspects of the product. This is where your market research and focus groups will come in very handy as you will be able to take all the feedback and questions you received and be ready for the same, preparing your pitch to cover these. Now that you have sourced your product, got your samples, conducted your research which is proving positive, you may feel ready to dive in and start approaching buyers and retailers, asking them to place orders. Before taking that jump, it’s very wise not to become complacent and make sure you are varying your product range. This offers several advantages. Concentrating on selling just one product will limit you. You should ideally have a complimentary RANGE of products. Appointments to buyers/retailers must result in a sale. If you show your potential buyer only one item, for example, an electric kettle and they do not want to place an order, your visit was a waste of your time. However if you then show the buyer your complementary range you have a better chance of securing an order. If they are not interested in youe kettle, they may be interested in your unique coffee maker, toaster and waffle maker. You get the point, remember, there’s safety in numbers! By offering a range, even if your buyer likes the main product you wanted to market, they may also like other products within your range, so an order that would have been for just one product, could turn into an order for several products. This increases profits for you and in the worst case, if the buyer did not like the first product you had in mind, they may like another in the range and still place an order. Don’t limit yourself but keep as many options as you can on the table. Many businesses are set up as agencies. There are two main types of agencies available and it’s extremely important you understand both. Both have their benefits and can offer you advantages depending on your personal situation and what you want to achieve. There are traditional agents and brokers. There is a lot to understand when dealing with agencies which is a little beyond the scope of this article but our online International Trade course goes into much detail on agencies and our one-to-one support can offer help and advice as to the best route for you and your business. Finding buyers for your products is obviously key to any import export business and our blog has an article with some suggestions on how to find buyers for your exports. Negotiation is one of the highlights of being an entrepreneur and being “the boss”. This is where you can set the terms of your business and drive a hard bargain. Negotiating is a key part of any business from the trader at your local market stall, to multi-billion pound companies the world over. Hone your negotiating skills, be confident and a little charming and you can walk away with the deal you want. We’ve seen on Dragons Den how the dragons and the entrepreneurs will negotiate back and forth, sometimes quite intensely until the deal is done with both sides feeling great about the agreement. As an entrepreneur this is a great feeling, securing the deal you want and giving you more confidence for the next deal. At every junction of your International trading business, you are going to have to negotiate. Once you’ve sourced your products, you’ll have to negotiate the price, the quantities, the samples and it won’t end there. When you approach buyers, you’ll have to negotiate the terms of the sale, the retail price, the wholesale price, minimum order, delivery time, exclusivity and the list can go on. Contract terms will need to be negotiated, which will follow in the next lesson. Buyers and Sellers seldom agree on terms and conditions of the contract on the first attempt. There are usually periods when both parties have to negotiate to reach an agreement. 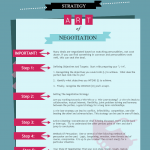 Before you enter into negotiations, you must develop an negotiating strategy. 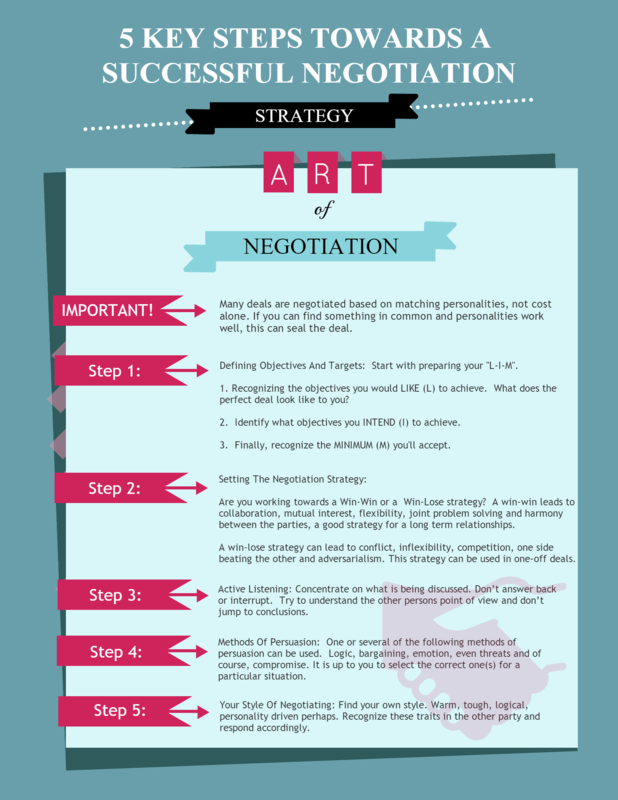 Here’s a few negotiation techniques to get you started. Negotiating becomes easier the more you do it. You will start to get an idea of how far you can push and what the other party will be willing to give up. As you do more and more deals with the same parties, you will be able to negotiate better deals and likely more quickly as trust will be built. As the other party gains trust in you by paying your bills on time and living up to your word, you may be able to negotiate even better deals going forward as you remove their “hassle factor”. Get It Delivered with Incoterms 2010. This is where you can really take hold of your business and show your import export knowledge. Terms of delivery is fundamental to any trading business and once you are familiar with these you will be in a much stronger position to negotiate and trade. It’s absolutely vital that you are aware of these terms of delivery and understand them. By understanding these terms, you are protecting your goods and covering your risk. Get this right and you’re half way to building your International trading empire. Incoterms 2010. Check out our blog post covering “What Are Incoterms?” for more understanding. These terms determine the buyer and sellers obligation and using these terms will clear up any confusion and stop close any issues before any disagreement arises. Needless to say, insurance of your goods is a must. Without this, the money that you’ve paid for you goods, should anything go wrong, is unprotected and will hit your cash flow and profits hard. Accidents happen and it’s a risk not worth taking and something that can easily be covered with each shipment. Marine Insurance gives cover from the sellers warehouse to the buyers warehouse, therefore it offers “Multi Modality” cover. As with all insurances there is small print and conditions that you must be aware of. Without understanding these, your shipment may not be covered, even though you have paid your premium. Taking the time to really understand insurance of your goods is vital to running a successful business. Terms and conditions of trade are possibly the most fundamental part of business. Without terms and conditions agreed upon, there will never be a contract signed or an order placed. Understanding the terms that your business associates want you to trade under and just as importantly, the terms that you will operate your business under, is massively important. Before you start trading, it is essential you have your terms and conditions in place as a buyer and seller. These terms and conditions will form part of your contracts and you must make sure these terms cover some basic issues. It is very important that your terms and conditions fit the goods of the contract. For an example, if you are dealing in electrical goods, the goods must conform to International standards for that product. In the case of food, the food must conform to import customs regulations and the food itself must conform to national hygiene standards, packing standards and shelf life. It’s advisable to write your terms and conditions of trade with the help of a lawyer so you can be sure they will stand any legal challenge. There is much to cover with terms and conditions which is beyond the scope of this short course but our Online International Trade course will cover this in more depth. Now you’re ready for the final step to take control of you future and become your own boss. Being an entrepreneur is exciting, negotiating and closing the deal is a rush and gives a great sense of achievement. Hard work and perseverance is a must but watching your business grow, increasing profits and securing your own financial future is massively rewarding. The final step is to decide how your company should be setup. There are two options, setting up as self employed or as a Limited Company. Many trade successfully using both types of setup but you must decide what’s best for you. Consulting an accountant and explaining your current situation, can be wise before you decide. An experienced accountant will help you make an informed decision and advise you which financial records you need to keep. Most accountants will give you one hour of their time for a reasonable cost. Keep the Tax Man Happy! VAT is a big part of running a business and it’s extremely important to understand this as an entrepreneur and business person. If you expect your annual turnover to be £81,000.00 or more, you must register for VAT. One of the advantages of being registered is that you can reclaim the VAT you pay on goods you bought for your business but NOT on personal purchases. An accountant will identify what you can claim for or go on line to the HMRC VAT webpage. If you anticipate trading with a turnover less than £81,000.00 you may register for voluntary VAT and reclaim VAT on goods you bought for your business. We hope this short article has given you an insight into how to trade Internationally and raised some of the pitfalls and best practices that you should be aware of. Many people start their businesses without being aware and unfortunately, will fold within the first 24 months suffering the loss of all the money they invested. It’s so important to understand your risks when importing and exporting, so we’ve make sure to review our quick guide on the nine most common mistakes when exporting so you’re not a victim of any of them. In order to really understand all aspects of trading globally, check out our online International Trade course. It’s a “to the point”, all-in-one course that teaches you exactly how to import and export in the real-world. No logistical theory, just streamlined content taught with a series of entertaining animated videos, validated by the London Institute of Shipping and Transport.